Cote d'Ivoire's President Alassane Ouattara during an interview, Abidjan, Ivory Coast, Oct. 29, 2015 (AP photo by Schalk van Zuydam). Last week, Cote d’Ivoire’s parliament approved the draft of a new constitution that President Alassane Ouattara says will “turn the page” on the country’s “successive crises,” and offer a “new social pact.” That’s because the new draft makes good on his 2015 campaign promise to lift the restriction on presidential candidates with dual nationality, a deep-rooted source of social tension in a country with a large immigrant population. 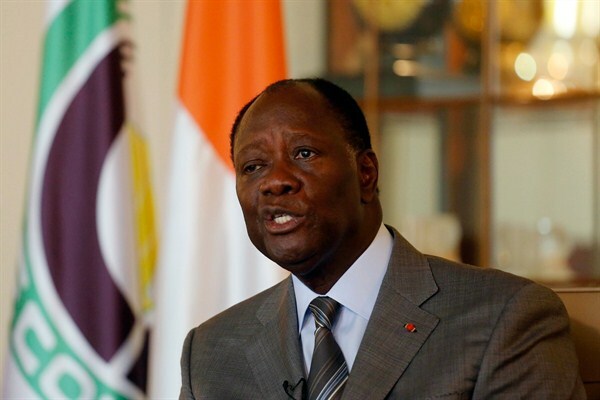 Ouattara himself had previously been barred from running for president, due to speculation that his father was born in Burkina Faso. Ivoirians will vote on the new charter in a national referendum on Oct. 30, which the country’s opposition forces plan to boycott.